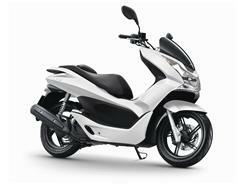 Honda has unveiled a new scooter for 2010 and launched new colours for two existing models the S-Wing 125 and the ANF125i Innova. It is reported the 125cc powered machine will eventually find its way to Europe. Its big innovation is an "idling stop system" where the engine will shut off automatically when the scooter comes to a complete stop. This can help save fuel consumption. The S-Wing 125 was originally introduced in 2007. It has a fuel injected 125cc engine, optional ABS and bags of under seat storage. It has only had minor tweaks for 2010 and comes in four colours including white, which is new for 2010. The Innova also has new colours for 2010, white, silver, black and blue.